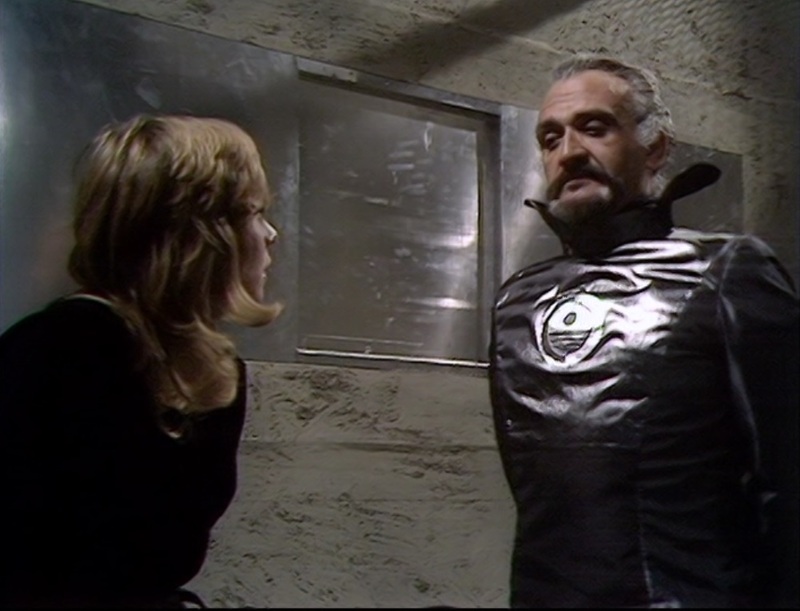 The Doctor and Jo spend most of part two of “Frontier in Space” in one jail cell or another. It’s a very frustrating episode, since I have never cared for stories in which our hero is a prisoner, but also because the Doctor has a really believable story and nobody wants to listen. “Frontier in Space” was written by Malcolm Hulke and it follows “Colony in Space” from two years previously in depicting a future Earth that’s really unpleasant and awful. Earth and Draconia are poised on the brink of a second galactic war and some third party is causing trouble. 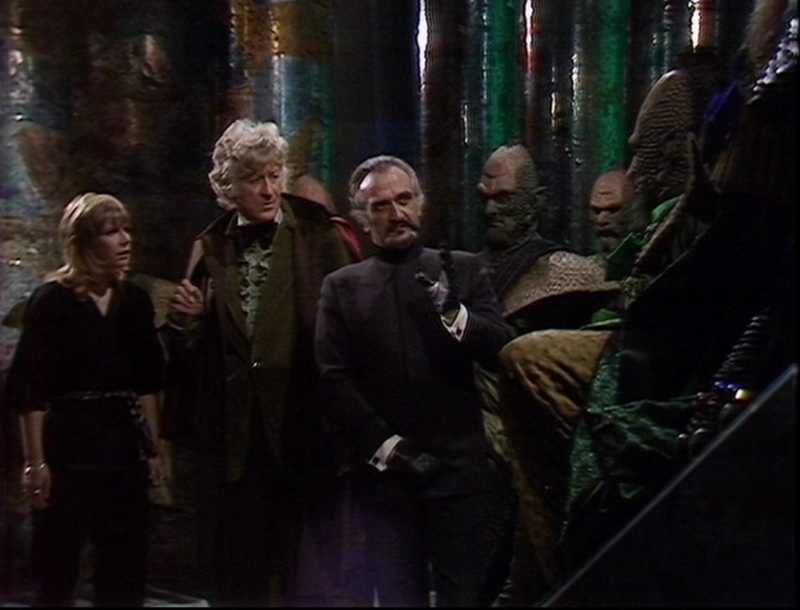 Earthmen, represented by a president who seems mostly ineffective and a general whose bloodlust is visible from space, believe the Doctor and Jo are Draconian agents, and the Draconians, who briefly capture the Doctor, think that the general is using them as patsies to justify his gearing up for war. Michael Hawkins has a terribly thankless job in playing this general. Ray Lonnen, who would later star in the amazing spy series The Sandbaggers, has a small role as an Earth soldier. So yes, there’s a lot of back and forth in this story so far, but I’m surprised that the Doctor didn’t follow an interesting lead that the Draconian ambassador suggested. The Doctor knows that some third party is employing Ogrons to raid Earth freighters, and the Draconians think the general is behind everything. Who’s to say that the general didn’t hire the Ogrons? Obviously he didn’t, but since Hawkins’ portrayal is spelling the man out as a baddie, it’s odd that the script didn’t even start to consider him as a suspect. We had an unhappy surprise last night as we were putting our son to bed. We told him about the plans for today and that we would be watching the next episode of Doctor Who, and he looked at the ground and said that he didn’t want to watch it. Now, back during “The Seeds of Death,” he threatened to stop watching the show for a month if the Ice Warriors ended up winning, but this was new. So a little later, after he was tucked in, I went back in his bedroom and sat on his bed with him and asked “Is there something about Doctor Who that’s bothering you?” He seemed reluctant to say beyond a quiet “…yeah.” Then I got it. “Are you afraid of the Drashigs?” His eyes got wide and he nodded firmly. I assured him that the Drashigs would never again appear in the show, except as pictures, or, in a couple of moments in this story, hallucinations. He confirmed that they are the scariest monster that he’s ever seen anywhere and worried that there would be a monster in this new story. I told him that we’ll be meeting a new race of aliens called Draconians, but that they are not monsters. And that’s the core of this story, oddly enough. The frightened soldiers of the expanding Earth empire refuses to see them as anything but monsters. 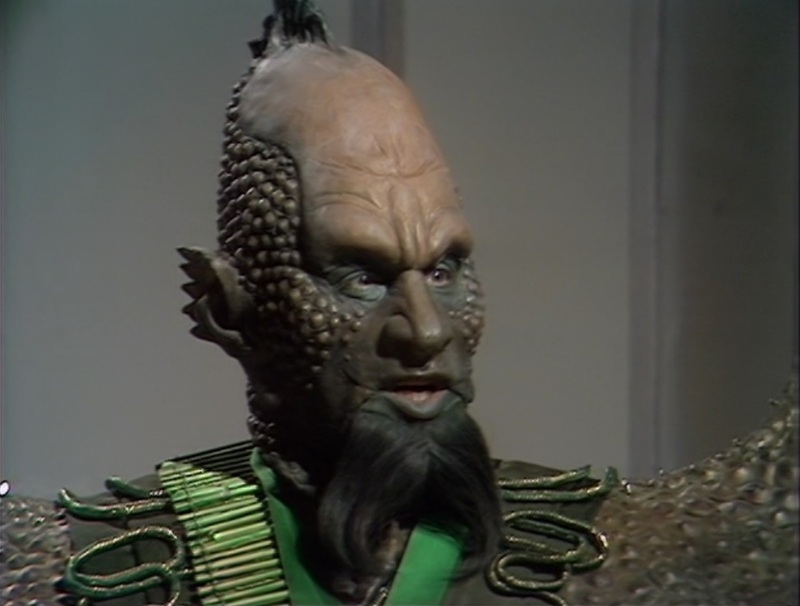 The Draconians are, no joke, one of the very best designs for aliens in the entirety of Doctor Who, and it really is surprising that these guys never returned to the series, because they’re incredibly successful both as visuals and as interesting alien characters. They showed up in comics and novels but I don’t think they’re even mentioned in passing in the TV show again until the 2010 story “The Pandorica Opens.” This story also features the return of the ape-like Ogrons – Paul Bernard also directed their previous appearance – and darned if they didn’t vanish from the series completely after this one as well. Lots of good comics and books use them – Gareth Roberts’ novel The Romance of Crime is a favorite – but the series moved on. In 2011, “Day of the Daleks” was released on DVD with a really interesting bonus feature: a complete special edition of the story with new special effects, several additional Daleks, some new footage for the climactic battle scene, and proper Dalek voices provided by Nick Briggs instead of those guys that did the original work forty years previously and sounded wrong. Unfortunately, the well-meaning team behind this otherwise entertaining upgrade also decided to cut the hilarious bit in episode one where an Ogron actor forgets to talk like an Ogron and just mumbles “No complications” in his regular voice. For shame! I love that part! We switched over to watch the special edition for part four. It might be fairly accused of having one or ten too many bells and whistles, but it does improve what was originally a pretty tame battle scene. The director, Paul Bernard, did his best, but he just didn’t have the resources to make this important sequence shine. Worse, the human part of the conflict is ridiculous. Sir Reginald absolutely refuses to evacuate. Nobody thinks to say “There is a bomb in this building and terrorists are attacking.” You’d think that would get people back in their cars. But with lasers all over the screen and smoke in the air and bullets ricocheting off Dalek armor and lines of bullets vipping along the ground and UNIT soldiers getting either exterminated or vaporized, there’s so darn much to look at. The third part of “Day of the Daleks” gets a little stick because of this silly bit of runaround where the Doctor and Jo escape only to get recaptured. It’s there because the plot needs a little action, which happens a lot in this kind of program, but it’s incredibly egregious here because the runaround is on the back of an ATV three-wheeler. These were only a couple of years old at the time and still unfamiliar enough to possibly look “futuristic” to the TV audience of 1972. 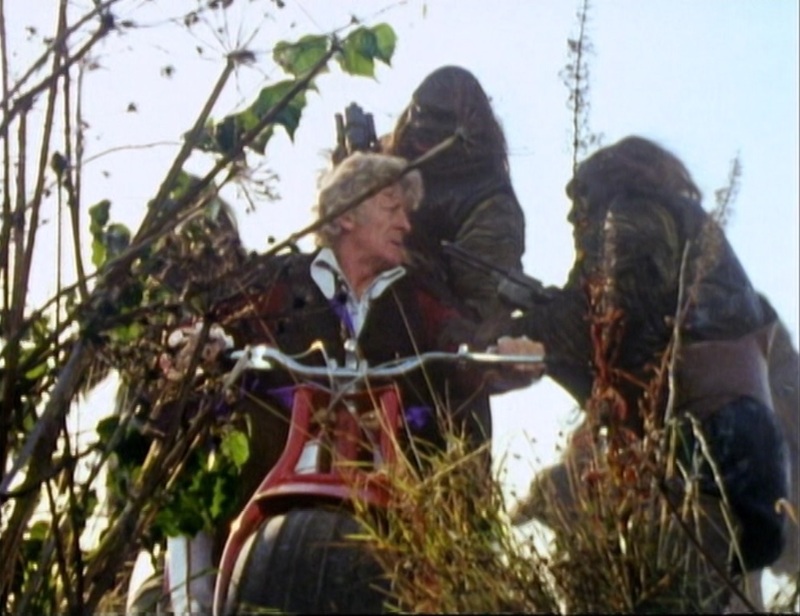 I think that if anybody from our day and age were to find themselves running from eight lumbering Ogrons, they wouldn’t pause to jump on an ATV, they’d just keep running. 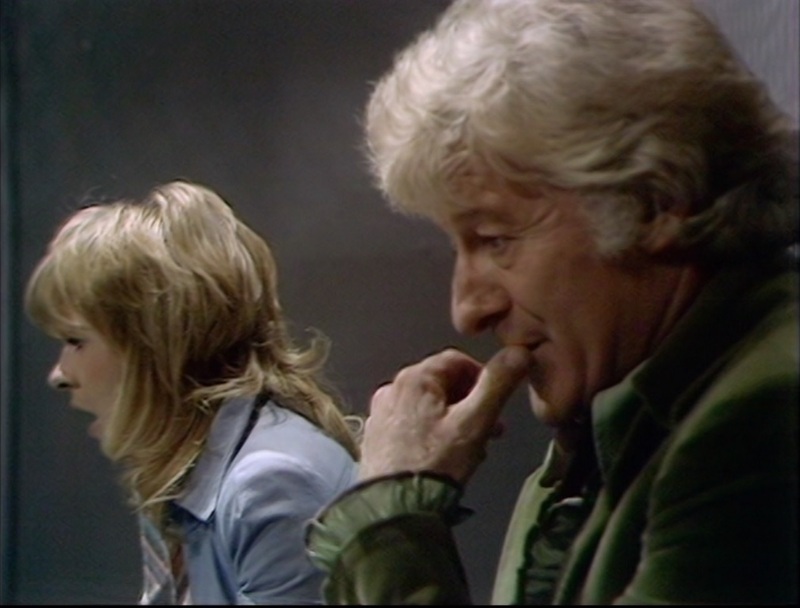 But never mind the runaround, Jon Pertwee is on fire in this episode. He’s full of righteous fury about the criminal government of the Dalek-occupied Earth, while Aubrey Woods tries to deflect with a load of nonsense about how the enslaved planet really just puts their hardened criminals to work in labor camps. It’s a really great scene, though I think it’s an underrated one. There’s a very effective cliffhanger too, surprisingly. I never thought much of it myself – the Daleks put the recaptured Doctor under a mind analysis machine that shows, weirdly, promotional photos of the previous two Doctors against the background of the show’s title sequence – but once again our son was riveted and frightened and hid his face. 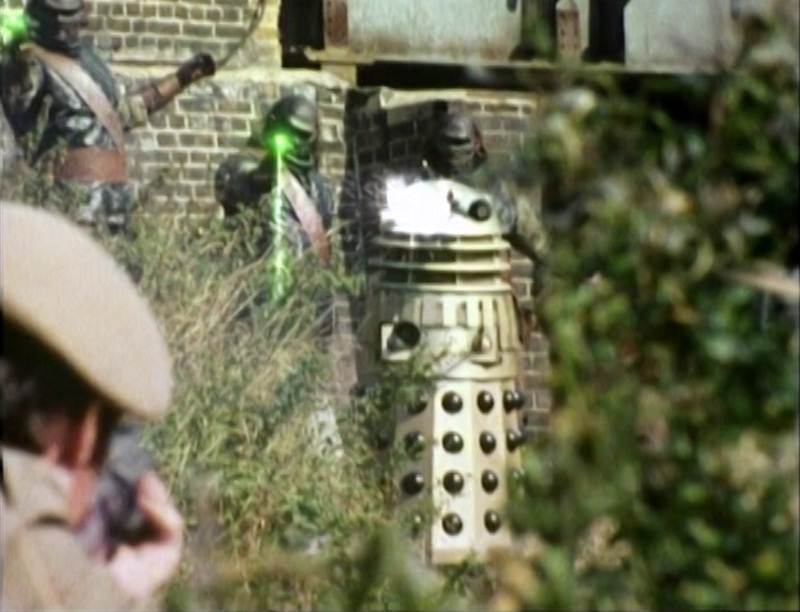 The Daleks are, “of course,” the show’s meanest enemy. How will he possibly get out of this?! Back to January 1972 and the ninth season of Doctor Who opened with the return of the Daleks to the series for the first time since the summer of ’67. They’d been retired while their creator, Terry Nation, unsuccessfully tried to sell the American networks on a series in which a Space Security Agent foils a new evil plot by the villains every week. I sometimes wonder about that show, and kind of think that it would have been a fondly-remembered series, but not a very successful one. Still, when they do invent transportation between parallel universes, that’s on my list to check out. I wonder who would have been in the cast*. Anyway, so the Daleks conquered Earth some time in our future, and in the 22nd Century, some fanatics have got their hands on some time travel equipment and have traveled back to “the 20th Century time zone” (just call it September 13, 1973, it makes sense) to kill a prominent politician for an as-yet-undisclosed reason. 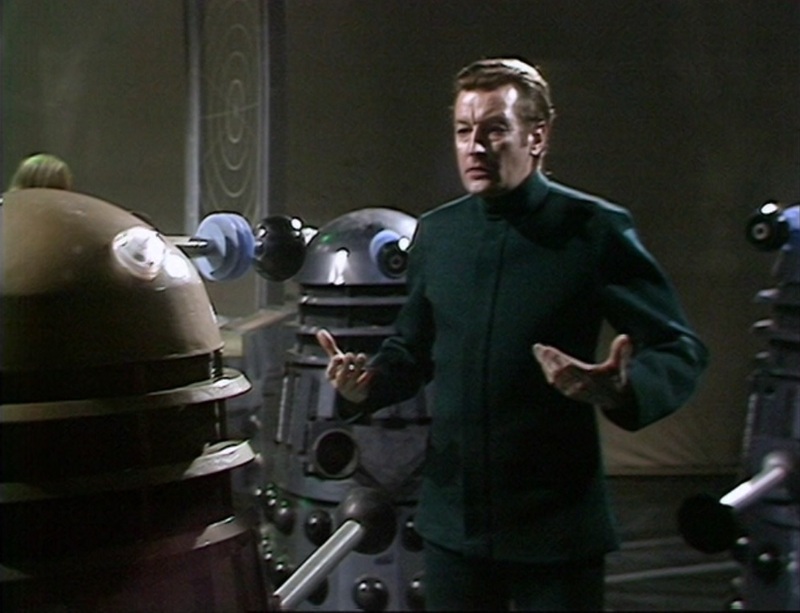 The Daleks mainly stay in a room in their future city where they yell at a controller character played by Aubrey Woods. But at the end of part two, the Doctor chases after the guerrillas and just about runs smack into a Dalek in a dark tunnel, which frightened the bejezus out of our son. 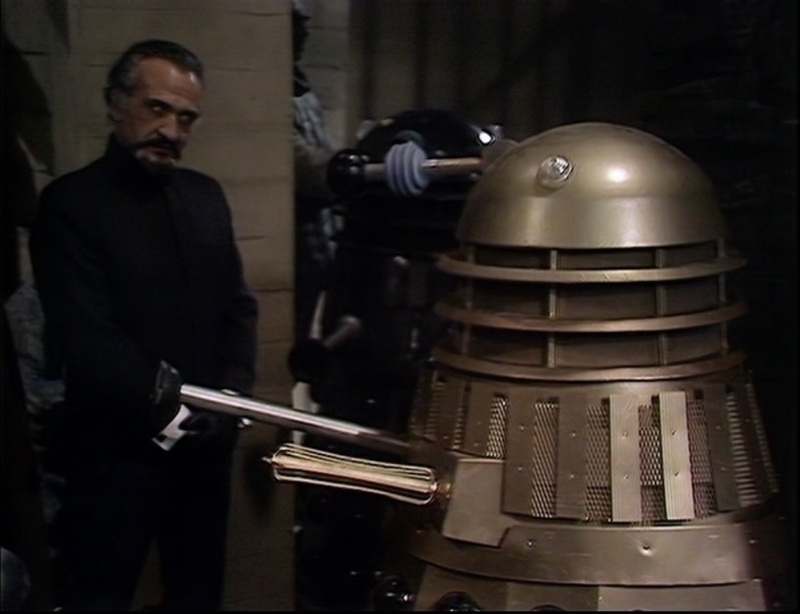 Any pleasure that might come from seeing the Daleks back – he wanted to talk and talk and talk between episodes about how many there were in 1966’s “The Power of the Daleks” – came crashing into the scary reality that creepy dark tunnels are not where you want to find a Dalek. The Daleks were apparently a late-in-the-day addition to this story by Louis Marks, who had last written for the show in 1964. He had the story about fanatics from the future trying to change history, and the ape-like Ogrons who do all the gunfighting, but the Daleks came on board to boost the marketing push. It’s the first Who serial directed by Paul Bernard. He did three of the ten serials in seasons nine and ten. Part one of this story features a scene that I absolutely adore. The Doctor and Jo are staying in this big country house waiting for another visit from the time travelers, and the Doctor has helped himself to the cheeses and wines. Jo takes some to feed a hungry Sergeant Benton, only to have Captain Yates order him to get back to work so he can take a snack for himself. “RHIP. Rank has its privileges,” he tells her.